Your Store-Bought Fish Might Be Illegal. And Probably Damaged The Environment. According to the 2013 annual report from Fisheries of the United States, the average American ate 14.5 pounds of fish and shellfish in 2013. Between 2001 and 2012, average annual US per capita seafood consumption was 15.7 pounds and the quantity of imported edible fishery products in 2012 reached 2,441,516 metric tons. 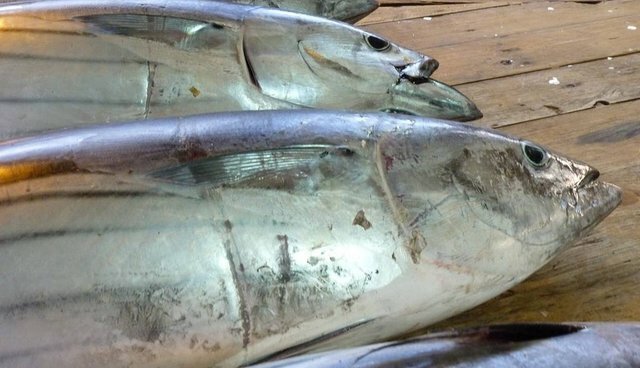 Because the US imports more than 90 percent of its seafood, close monitoring of imports is required to ensure that this demand for fish products does not create incentives for illegal activity. Illegal, unreported, and unregulated (IUU) fishing, or "pirate fishing," refers to fishing conducted in violation of national laws or internationally agreed-upon conservation and management measures. The United Nations Convention on the Law of the Sea (UNCLOS) requires that countries must monitor and control fishing vessels that fly its flag. However, levels of pirate fishing continue to increase, and global losses due to IUU fishing are estimated to be between $10 billion and $23.5 billion per year, representing between 11 and 26 million tons. West and Central African coastal waters are very rich in demersal and pelagic fish populations. Lack of appropriate governance and management frameworks to control the use of fish resources has made the region a prime target for criminals involved in IUU fishing. West African waters are estimated to have the highest levels of IUU fishing in the world, representing up to 37 percent of the region's catch at a cost to the region of $1.3 billion per year. Many industrial fishing vessels operating in the West African region are reported to be out of control: fishing well inside exclusion zones, attacking local fishers, refusing to pay fines, covering their identification markings, using banned fishing equipment, transshipping fish illegally at sea, refusing to stop for fisheries patrols, bribing enforcement officers, fleeing to neighboring countries to avoid sanctions, committing labor violations, and using Flags of Convenience (i.e., hiding the ownership of the vessel by buying a flag from a State that lacks the ability or willingness to monitor its activities). From 2000 to 2006 and 2011 to 2013, there were at least 183 documented IUU fishing cases in just six West African countries (Gambia, Guinea, Guinea-Bissau, Mauritania, Senegal, and Sierra Leone) - all of which involved Chinese-owned or flagged vessels, with at least 31 percent of them having engaged in illegal fishing activities more than once. Along with the economic losses, pirate fishing in West Africa severely compromises the food security and livelihoods of coastal communities. In Sierra Leone, fish represents 64 percent of total animal protein consumed in the country, and an estimated 230,000 people are directly employed in fisheries. Throughout Africa, rural coastal fishing communities are directly dependent on the services provided by coastal and marine ecosystems and are often poor, vulnerable, and likely to suffer most from environmental change and the depletion of fish resources. Fisheries provide employment for up to 10 million people in Africa, often in labor-intensive, small-scale fisheries that include both subsistence and commercial activities for people involved in the harvesting, selling, and processing of fish products. Something must be done - urgently - to end these extremely damaging practices. Today, the National Oceanic and Atmospheric Administration (NOAA) and the West Africa Sub Regional Fisheries Commission (CSRP) are organizing a training session between nine West African countries to increase their capacity to efficiently fight against IUU fishing. Born Free USA is proud to have facilitated the organization of this training, which will bring authorities from these countries the tools they need to continue fighting more efficiently against IUU fishing. Born Free USA is committed to providing support to West African governments in their fight against IUU fishing. We cannot turn a blind eye on the impacts these practices have on food security, social welfare, fish stocks, marine environmental health, endangered species, or the potential for political unrest in coastal communities!